Twenty-six days after his election, Pope Francis has brought the US' Appointment Shop back to life this Monday with two domestic nods among a spate of others. The shot above is no accident, however, as this first round is a keen exercise in continuity. At Roman Noon on this delayed Annunciation Day, the pontiff named Bishop Michael Jackels of Wichita as the ninth archbishop of Dubuque. 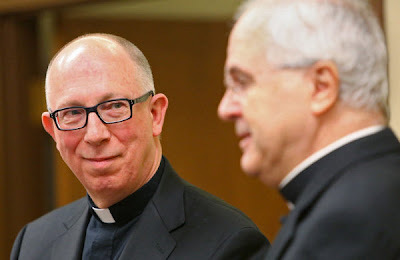 A CDF aide to the future B16 (both above) from 1997-2005, the Kansas prelate – who turns 59 on Saturday – succeeds Archbishop Jerome Hanus OSB, 72, at the helm of the church in Iowa, a bastion of tradition in the mostly rural outpost that's home to the famous "Field of Dreams." Following a year's worth of reports indicating that consultations for his successor were underway, in a statement this morning, Hanus said that "my health has declined in recent years. "As a result," the onetime abbot of Conception revealed, "some time ago I submitted my resignation as archbishop to the proper authorities." One of John Paul II's final appointees to the Stateside bench, such was Jackels' comfort with his longtime boss that, when the new archbishop-elect stepped up to greet Benedict during the annual orientation for new bishops in September 2005, the now Pope-emeritus is said to have exclaimed "Look at you!" at the sight. 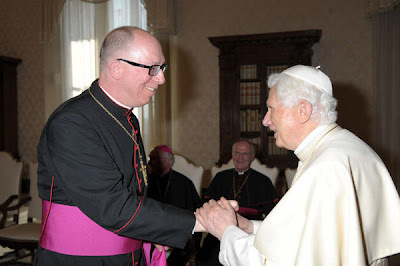 Not having seen Joseph Ratzinger since his election, the story goes that the junior prelate shot right back at B16 by responding "Look at YOU!" At the same time, Francis tapped Msgr John Folda, 51 – a considerable talent who's served as rector of Lincoln's St Gregory the Great Seminary almost since its 1998 opening – as bishop of Fargo, succeeding Archbishop Samuel Aquila, who was transferred home to Denver last May. For a Pope whose shifts of style have won an extraordinary amount of raves from progressives, it is indeed conspicuous that Papa Bergoglio's first American personnel moves – more than any other aspect of a pontificate, the place where the rubber hits the road – have both gone to priests of Lincoln, a diocese that's made its name in recent decades on anything but a liberal bent. Neither of the nominees, however, are natives of Husker Country – born elsewhere, both only entered seminary after attending the University of Nebraska as undergrads. In any event, as Francis' identikit for nominees begins to emerge, both appointments reflect a premium on picks who've yielded impressive, concrete results. On that front, Jackels' Wichita has set a national high-watermark both in priestly vocations and a stewardship-based Catholic school system believed to be the US' lone outfit that (get this) doesn't charge tuition to active parishioners, while the Lincoln seminary – whose fairly recent establishment bucked the prevailing trend – has served as the engine behind the building of a formation group numbering over 40 men, a figure barely equaled even by most of the largest local churches on these shores. Comprising Southern Nebraska, the Lincoln diocese has roughly 100,000 Catholics, but – just like the equally-sized and vibrant Wichita church – enjoys an outsize prominence on the wider stage thanks to two kinds of exports: ideas and initiatives born there which have been taken up elsewhere, and the unusually high numbers of clergy from each who've gone on to become bishops. Tellingly as well, both of today's nominees speak Spanish, reflecting the significant uptick of Latino migration into the heartland. In Dubuque's case, that new reality was highlighted by a 2008 immigration raid on a local food processing plant that saw the arrest of 400 undocumented workers and in whose wake Hanus memorably led protest marches in solidarity with the detained as the impacted parish served as a "command center" for aiding affected families. Predecessor and successor shown above at this morning's press conference, Jackels' installation in Dubuque has been scheduled for May 30th; in retirement, Hanus will return to his Benedictine confreres in Missouri. According to friends, the Wichita crowd were said to be "bummed" and "emotional" on hearing of Jackels' departure. As for Fargo, the date still undetermined, Folda's ordination is expected to take place in late June. With today's appointments, eight Stateside Latin dioceses stand vacant, with another eight led by (arch)bishops serving past the retirement age of 75. 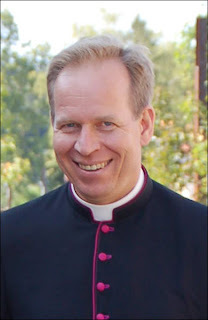 Following last week's installation (homily) of Archbishop Alex Sample in Portland and ordination (video) of Bishop David Talley as an unprecedented second auxiliary of Atlanta, only one B16 move remains to be executed in the US: the ordination of Bishop-elect Robert Coyle as an auxiliary of the 1.5 million-member archdiocese of the Military Services, which is scheduled for St Mark's Day, 25 April, in Washington's Basilica of the National Shrine of the Immaculate Conception. A priest of Rockville Centre and Navy commander with a quarter-century in uniform, the 48 year-old was named on 11 February, the same day that Benedict blew out the news-cycle by announcing his historic resignation. On a related note for both the military and the Midwest, meanwhile, this week likewise brings a long-sought posthumous recognition for one of the more celebrated chaplains of recent times, as the Kansas-born Fr Emil Kapaun receives the nation's highest award – the Medal of Honor – 62 years after his death at 35 while serving in the Korean War. A priest of Wichita who inspired an enduring loyalty while ministering to the Army on the front, Kapaun's cause for beatification was opened in 1993. Jackels is reportedly to attend the Thursday White House ceremony at which President Obama will present Kapaun's Medal to the chaplain's sister-in-law. 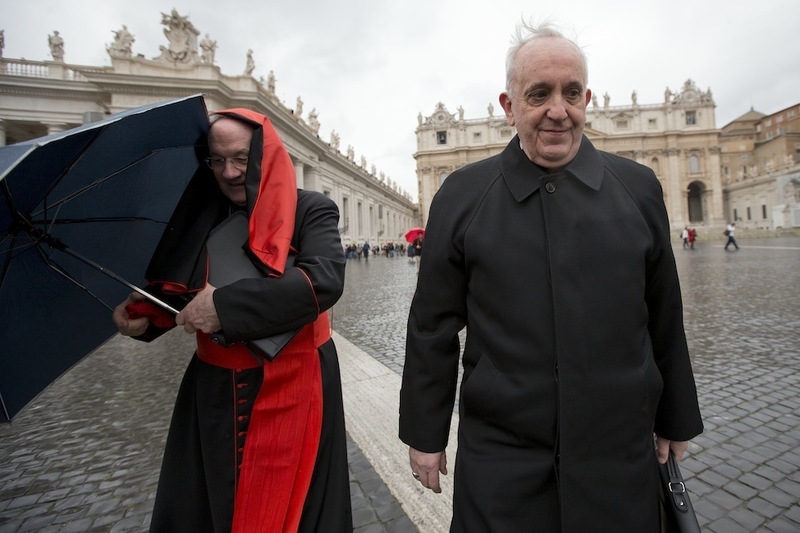 To date, "Hatman" – who spent most of his priesthood in Latin America as a seminary professor and rector – is one of just three top officials to already have had multiple meetings with Francis. By contrast, what's usually the most significant "standing appointment" on a pontiff's calendar, the Friday audience with the prefect of the CDF, currently Archbishop Gerhard Ludwig Müller, has taken place just once so far, while only over this past weekend did the Pope sit down with his top liturgist, the Spanish Cardinal Antonio Cañizares Llovera. For purposes of context, it's worth noting that every appointment approved by Benedict XVI prior to his resignation was announced before February 28th, after which any unpublished moves would've lost their effect. Even if, over time, Francis will almost certainly tweak the selection process to better fit his style, the final decisions on nominees are coming from the Argentine Pope. Prior to today's releases – which included the succession to the Filipino diocese of Imus, left vacant by then-Bishop Chito Tagle's 2011 transfer to Manila – Francis had appointed all of two diocesan pastors, naming 65 year-old Bishop Mario Aurelio Poli, his former auxiliary in Buenos Aires, as his successor in the Argentine capital on Holy Thursday, and in a surprising nod, promoting the military ordinary of Lithuania, Bishop Gintaras Grusas, 51, to the country's lead post, the archbishopric of Vilnius, on Friday's retirement of Cardinal Audrys Backis. Beyond his youth – a common trait among recently-named prelates in the Baltic country, several of whom are in their early 40s – the astonishment over Grusas' meteoric rise can be chalked up to the new archbishop's extremely unusual background. Born in Washington and raised in Southern California, the incoming primate (right) studied mathematics and computer science at UCLA, then spent five years working for IBM before entering the seminary – a formation which began at Ohio's celebrated Franciscan University of Steubenville. When it comes to Francis' appointment checklist, however, perhaps the best early articulation of it can be found in a 2010 Catholic News Service profile of Grusas. "I'm not sure if the marketing world took it from Jesus," the now-archbishop said, "but there are some basic principles that apply like: People buy from people they like. The point, as Grusas put it: "When you evangelize, you don't want to come around with a stick and beat it into people. It just doesn't work." Elsewhere, in his first major pick for the Curia, on Saturday the Pope named the 119th successor of St Francis – the minister-general of the Friars Minor, Spanish Fr José Rodriguez Carballo, 59 – as #2 of the Vatican's "Congregation for Religious," the dicastery responsible for the oversight of the global church's million-plus consecrated men and women. While some among the less steeped viewed the move as a sort of sea-change, in reality it's just a continuation of the post's recent SOP. As president of the Union of Superiors General, Rodriguez is the third consecutive (elected) leader of the umbrella group comprising the heads of mens communities to be named secretary at Religious. In 2006, Benedict XVI likewise tapped the then-USG president – the head of the Conventual Franciscans, Gianfranco Gardin – for the job. Gardin was then succeeded by the USG vice-president, the venerable Joseph William Tobin, shortly after the Detroit native completed the maximum 12-year term as head of the Redemptorists. Amid little secret of his discontent over the recent Curial push to fine-tune the leadership of the US' women religious, Tobin's October transfer to Indianapolis led to the Religious post's latest opening. That said, while the last days of B16 saw widespread speculation tipping the choice of an American more disposed to the "crackdown" school as the Redemptorist's replacement, Francis' chosen course has instead handed the win to another among his handful of Vatican allies: the prefect of the office formally known as the Congregation for Institutes of Consecrated Life and Societies of Apostolic Life (CICLSAL), Brazilian Cardinal Joao Braz de Aviz. During the interregnum, the Religious chief – said to have been despondent over the loss of his last deputy, especially given the prevailing wind at the time – saw his regard among the cardinals spike after his reported takedown of Benedict's embattled Secretary of State, Cardinal Tarcisio Bertone, in the General Congregations scored an ovation from the floor. In a new pontificate, however, all things are new, and the Vatican footage of Braz's latest meeting with the Pope relayed images of the cardinal looking almost giddy, acting familiar and even a tad playful with Francis on entering the Papal Apartment in the Apostolic Palace, which the new pontiff continues to employ as his daytime "office." On another HR front, meanwhile, Italian reports today tip an even more significant shift on the new Pope's part. As primate of Italy, the pontiff has traditionally held the prerogative of appointing the president and general-secretary of the country's powerful bishops' conference, known as the CEI, as opposed to the usual practice of the top office holders being elected by the body. According to a piece in today's La Stampa, however – in keeping with his already evident preference for decentralization – Francis is looking to move toward the model employed everywhere else, in which the Italian bishops would choose their own leaders. Himself a former two-term president of the Argentine bishops, despite heading his homeland's most significant diocese, Jorge Bergoglio reportedly declined the leadership of the conference before accepting it the next time around.